The Plant Guru® venture was started online as a family owned business. They do not advertise, they have no MLM (Multi-Level Marketing) therefore, no multi-level pyramid prices that raise essential oil costs to the consumer. Their 100% pure essential oils are within your means to buy and you reap the benefits with enormous savings. Their mission is their passion for essential oils, not gouging the public with outlandish prices. Plant Guru® wants everyone to enjoy their involvement immersing themselves in aromatherapy with therapeutic values. They feel that a 15 mL bottle of oil should not be priced out of the world. Customer satisfaction is guaranteed with a refund or exchange within your purchase of 30-days. Plant Guru® sources their essential oils globally that meet USDA Organic (USA Department of Agriculture) standards. The essential oils are subject to third-party testing and are 100% pure therapeutic-grade essences. They do not use GMO (Genetically Modified Organism) oils and are GMP (Good Manufacturing Practice) certified using sustainable farming. For having the best quality essential oils in the marketplace, Plant Guru® uses GC/MS (Gas Chromatography Mass Spectrometry) to delve into the molecules of each plant and checks to be sure their oils do not have fertilizers using chemicals or have insecticides or any repellents used in the growing process. Gas Chromatography (GC) is a system to separate the powerful compounds in essential oils into individual components. The GC method uses a computer that produces a linear graph that charts the individual components. They are concerned about their consumer’s health and safety using their products so always go a step further ensuring that. Plant Guru® observes to rigid quality control and will provide you with technical documentation and certificates of analysis, MSDA (Material Safety Data Sheets), and country of origin for each oil they carry. The oils are wild crafted and certified pure through their sources. Essential oils are powerful and volatile, meaning they will burn around flames. One or two drops is all you will need depending on your method of use. Steam distillation is the method that breaks up the water in the oil from the plant oil’s chemical components from the source. Bergamot (Citrus Bergamia) essential oil is cold pressed from the rind of the fruit. Bergamot boosts your mood and builds self-confidence, treats infections, hysteria, anorexia, eczema, acne, scars, and pimples. Mix with a carrier oil and massage on your skin or put into a diffuser and mist. It will help to minimize muscle tension and headaches. Breathe Synergy Blend Essential Oil from Plant Guru® is a blend of 100% pure oils of Eucalyptus (Eucalyptus globulus), Peppermint (Mentha piperita), Tea Tree (Melaleuca alternifolia), Lemon (Citrus limonum), Lavender (Lavandula angustifolia), Cardamom (Elettaria cardamomum), and Bay (Laurus nobilis). Synergy is the interaction of the different oils working together in harmony for a combined effect to increase the capacity of the lungs to help you breathe. Use in your ultrasonic diffuser adding 2 to 5 drops and blend with your carrier oil at a 3 to 5% dilution for topical body applications. This blend can cause sensitivities; therefore, only blend for applying to your skin and never apply undiluted from the bottle. Plant Guru® has wonderful sets, for example essential oils, body butters, waxes, carrier oils, incense, and more for you and your loved ones as gifts. Improve skin, hair, reduce aging effects, heal, and more. Pamper yourself and friends with the Carrier Oil Variety-5 Pack in 4-ounce bottles each. The 100% pure carrier oils are high grade being Apricot Kernel Oil, Fractionated Coconut Oil, Grapeseed Oil, Avocado Oil, and Sweet Almond Oil. Add a few drops of your favorite essential oil from Plant Guru® for an amazing soothing massage. 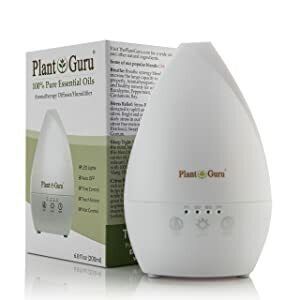 Plant Guru® offers many gift sets, weight loss sets, respiratory sets, beginner trio, kitchen sets, earth, and wood set, top 6, and top 14 for your essential oil pleasures. These are wonderful gift sets for your essential oil loving friends and family and they are affordable. The oils can be used in a diffuser, in the bath, and added to massage creams, used as aromatherapy, body butters, great for making soap, wonderful for relaxation, and are comparable to high-end essential oils in the marketplace today. You can buy the Plant Guru® products at wholesale prices and become a distributor. Unveil the secrets of Mother Nature’s plant kingdom for a new healthy standard of living. The ancient cultures understood plants and their benefits as did the new pioneers struggling with the land to live here with the Native Americans who truly understood and respected all plant life from the bristle cone conifer’s tiny 4000-year-old seeds to the giant Sequoia trees.